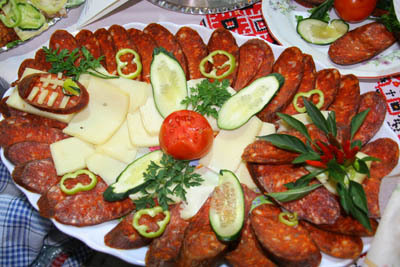 Do you want to know the secret of Hungarian Sausage and salami? If I'm not mistaken that you are interested in Hungarian Sausage that should be the reason why you clicked on this page. I put together this page just to satisfy your curiosity. I hope you can find below the information what you are looking for about our famous sausage, but if you feel something is missing please don't hesitate to contact me. You can find here a generic overview of the Hungarian Sausage, which is one of the most famous Hungarian products (Hungaricum) in the world. The ancient Hungarians living at the time of the conquest of the Carpathian basin carried dried meat on their adventures, which allowed them to quickly prepare a delicious stew. The same was true for the shepherds, herders and cowboys, who spent most of the year away from their homes. One of the greatest celebrations of rural farms was the slaughtering of the pigs. The meat of the fattened animals had to be preserved and portioned out carefully. This led to the development of modern sausages and salamis. The high-quality, ground paprika and the onions grown on the southern edges of the Great Hungarian Plains (Alföld), which far surpassed the quality of other European onions, increased the urge to experiment. Especially there are two towns which are the most famous for onions and paprika. Makó is the capital of onion cultivation and Szeged is the best place for growing paprika. What are the different types of Hungarian Sausages? 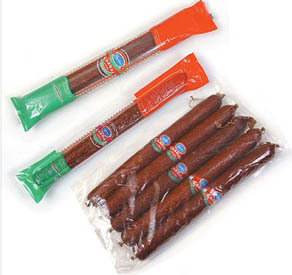 The most famous brands of traditional sausages are the Csabai and Gyulai sausages. 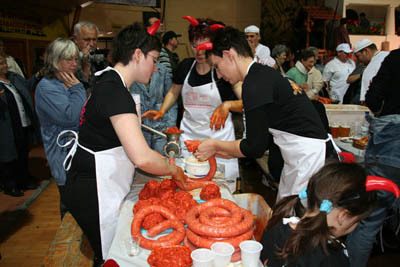 There are also a number of distinctive types of smoked and 'flamed' sausages, thick and thin sausages, slightly spicy or hot sausages (for example, the 'fires of hell'), whilst sausages made from game are considered gourmet delicacies. Sausages can be fresh or seasoned, single or in pairs, whilst homemade pork sausages are totally unique - however, the resulting flavor is always truly tasty. There is still a living tradition in Hungarian families - mainly in rural areas -this is the sausage and salami making. Every householder is very proud of his unique salami or sausage. 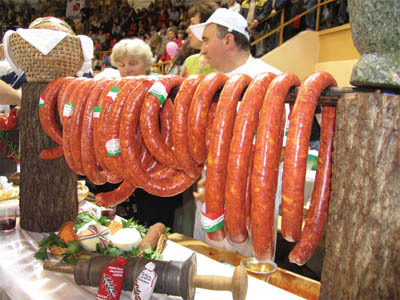 In Hungary the sausage and salami making always happens mainly in January and February during the cold winter months. Due to the easily understandable fact that the risk of getting tainted meat during this time period is very low. As the readymade sausage and salami have to be smoked for canning, slow and cold smoke is applied here. This type of sausage does not keep so long and is intended for quick consumption. In 1869, a merchant named Mark Pick decided to widen the range of his grain store with a long-lasting type of salami. This was the beginning of a nearly 150-year-long success story. Not only has Pick salami become an internationally renowned product, it is also a protected Hungarian brand. Its reputation is due to its amazing taste and consistently high level of quality which is partially enhanced by the mystery surrounding the salami: its recipe is still a closely-guarded secret. If you want to know more about this unrivalled Hungarian salami, please visit my Pick Salami page. Here you will find lots of interesting information about this delicious Hungaricum. In recent decades, this industry has undergone a number of major developments. The cold cuts traditionally prepared from pork have been supplemented with a wide range of products made from chicken, turkey, beef, and game. Although these receive less attention, the quality products can easily prove to be just as good.